The cultural hotspot mobile unit creates a two-fold opportunity: to better inform the public about the Valletta 2018 cultural programme and upcoming activities as part of the national cultural calendar; while at the same time the public has a direct link with the Foundation. 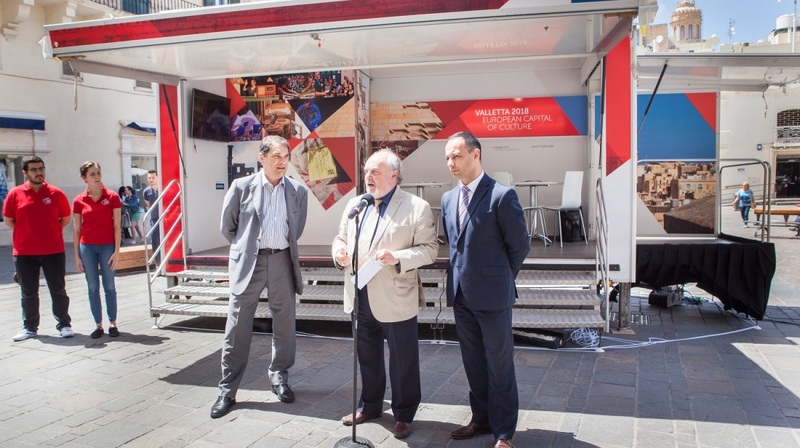 The Valletta 2018 Foundation today unveiled the first cultural hotspot mobile unit, at Pjazza San Ġorġ, Valletta. Mr Micallef highlighted that the Valletta 2018 Cultural Programme is growing rapidly and being strengthened year on year. The cultural hotspot mobile unit creates a two-fold opportunity: to better inform the public about the Valletta 2018 cultural programme and upcoming activities as part of the national cultural calendar; while at the same time the public has a direct link with the Foundation. The mobile unit will remain in Pjazza San Ġorġ for the duration of the Valletta Green Festival, taking place From Friday 29th till Sunday 31st May. From time to time, the cultural hotspot mobile unit will be touring different towns and villages in Malta and Gozo and will be present during events organised by local councils and celebrated by communities. Also addressing the press conference, Arts Council Malta Chairman Albert Marshall said: “The concept of mobility is essential for culture to be accessible to all, hence the need to share information about cultural projects launched by cultural entities and addressed to the community. The cultural hotspot project is an ideal platform for this to take place”. Dhalia Chairman Chris Grech said: “In the last couple of years we have witnessed an incredible revival of the city of Valletta, with an increase in demand for both commercial and residential investments. These changes have promoted us to seek strategic partners in Valletta, with strong presence, and we were fortunate enough to strike a collaboration agreement with Valletta 2018, superbly led by Jason Micallef with passion and determination to transform Valletta into a social and cultural hub 24/7”.